Chapter headings and selected section headings: Series Preface. Preface. Foreword. Introduction. History of CALPHAD. Introduction. The early years. The intermediate years. The last decade. The current status of CALPHAD. Basic Thermodynamics. Introduction. The first law of thermodynamics. The second law of thermodynamics. The third law of thermodynamics. Thermodynamics and chemical equilibrium. Solution phase thermodynamics. Thermodynamics of phase equilibria and some simple calculated phase diagrams. Experimental Determination of Thermodynamic Quantities and Phase Diagrams. Introduction. Experimental determination of thermodynamic quantities. Experimental determination of phase diagrams. Thermodynamic Models for Solution and Compound Phases. Introduction. Stoichiometric compounds. Random substitutional models. Sublattice models. Ionic liquid models. Aqueous solutions. Phase Stabilities. Introduction. Thermochemical estimations. Ab Initio electron energy calculations. The behaviour of magnetic elements. The effect of pressure. Determination of interaction coefficients for alloys and stability of counter-phases. Summary. Ordering Models. Introduction. General principles of ordering models. Features of various ordering models. Empirical routes. Role of lattice vibrations. Integration of ordering into phase diagram calculations. Comments on the use of ordering treatments in CALPHAD calculations. The Role of Magnetic Gibbs Energy. Introduction. Derivation of the magnetic entropy. Derivation of magnetic enthalpy, Hmag. Derivation of magnetic gibbs energy. The effect of alloying elements. The estimation of magnetic parameters. Multiple magnetic states. Changes in phase equilibria directly attributable to Gmag. Interaction with external magnetic fields. Computational Methods. Introduction. Calculation of phase equilibria. Thermodynamic optimisation of phase diagrams. The Application of CALPHAD Methods. Introduction. Early CALPHAD applications. General background to multi-component calculations. Step-by-step examples of multi-component calculations. Quantitative verification of calculated equilibria in multi-component alloys. Selected examples. Summary. Combining Thermodynamics and Kinetics. Introduction. The calculation of metastable equilibria. The direct coupling of thermodynamics and kinetics. Future Developments. 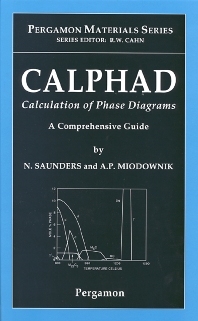 This monograph acts as a benchmark to current achievements in the field of Computer Coupling of Phase Diagrams and Thermochemistry, often called CALPHAD which is an acronym for Computer CALculation of PHAse Diagrams. It also acts as a guide to both the basic background of the subject area and the cutting edge of the topic, combining comprehensive discussions of the underlying physical principles of the CALPHAD method with detailed descriptions of their application to real complex multi-component materials. Approaches which combine both thermodynamic and kinetic models to interpret non-equilibrium phase transformations are also reviewed. For chemists, physicists, material scientists, graduate students and researchers.